The hunt for the spring scythe is a very interesting and exciting activity. Even if you are left without a trophy, the very observation of the current, during the battles of roosters will give you great pleasure. Before you go on black grouse, be sure to check everything connected with it. 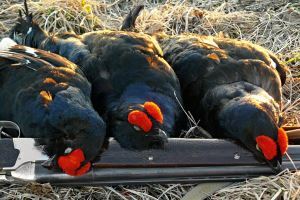 Licenses for black grouses have been introduced in almost all regions. Our cost is 100 rubles. for one trophy. Spring hunting is carried out everywhere on the basis of a license, the number of copies is strictly limited. In the spring , the hunting season for a kosach usually coincides with the time for a waterfowl , and is carried out exclusively on current. In some areas, spring hunting for a scythe is generally prohibited. Hunting grouse is a favorite occupation for a huge number of hunters. It is hunted both in the fall and in the spring. From the hut and from the approach. If both the female and the male are allowed to shoot in the autumn hunting season, in the spring, hunting is carried out exclusively on the male . It is easy to distinguish them. 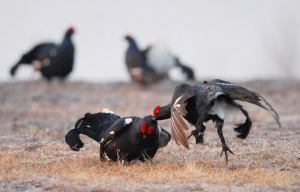 Grouse has a bright black color, it is larger, in the spring, his eyebrows become bright red. Its tail has a small white plumage and has a crescent shape, for which he received the name Kosach. In some regions, it is also called Chernysh for its coloring. The female is variegated and slightly smaller in size. Call her grouse or malyuha. Typically, the current grouse always passes in the same place . Only a negative impact in the form of human factors or forest fires can affect the change of current location. Kosachis like to arrange for currents in dry marshes, in forest glades, edges, glades, etc. The forest should be mixed, in exclusively coniferous forests, especially in them more often, the kosach current is not satisfied. Determine the place of the current is not very difficult. Since the end of February – the beginning of March, a flock of squids are kept near the current. On a clear, frosty morning, they like to sit on the treetops, and their mutterings can be heard for kilometers. This fact is the best pointer to the place of current. Usually the current itself takes place in April-May , depending on the region. In the complete darkness, the squash sit on the trees next to the current, which is accompanied by a distinct flapping of the wings. Then go down to the ground. The oldest Tokovik rooster begins to talk, having made a sound like “Chufysh” several times, its hunters call chufykaniy. After that, he jumps several times in the air and begins his song, which looks like a pigeon cooing, amplified several times. The rest of the kosachs begin to gather on the current, including in this “chorus”, consisting of chopping and loud muttering. In the “wild” places where people rarely appear, the number of tokos can be more than fifty. Young roosters usually first observe the behavior of more experienced pigs, joining the current a little later. It is very interesting to watch the fights of roosters . They fly at each other, peck the opponent and beat their wings. Only feathers fly in different directions. One day, my friend climbed up on the current at night, covered himself with a large piece of tarpaulin, and at dawn watched battles fighting. In the excitement, some even ran on it. (In our region, not so long ago there was a ban on the spring squash, unfortunately). In the midst of the current appear malyuhi. At about 9 o’clock the current subsides . Evening current often happens , only it is very short in time and the number of current roosters is much less. When the place is cooked, the hunting process itself begins. Coming to the hut should be still dark, before the appearance of kosachs. Meters for 200 from the current all movements should be as quiet as possible so as not to frighten overnight grouses nearby. Shooting a tokovik should not be , it can disrupt the entire current. The hunter must patiently wait for one of the roosters to approach the hut at a distance of a sure shot. Close shoot is not worth it, you can smash the coveted trophy. For a shot, the distance from 15 to 40 meters will do , and further it makes little sense to shoot too. The distance can be designated in advance by landmarks, so as not to be mistaken at dusk, determining it visually. Shoot a scythe in the side , so less likely that a wounded bird can fly away. Wounded animal is best to get the second shot. The shot must be made during the silence of the squat. They, unlike wood grouses, do not fade away while singing. It is believed that the shot is not very scary roosters and after a short period of time, they again recite the current. You should not leave the hut for the selection of the trophy, the appearance of a person on the current will precisely make the birds fly away. It is better to wait for it to finish. If you have a license for the second man, you can wait for another good moment and get the second trophy. The most common way to hunt a spring squash is hunt from a hut. If the hut is equipped for a long time , then this is a big plus when hunting. If you are first on the current and are going to make a hut , then you must take into account a number of rules when it is built . A place for the hut should be chosen not in the very center of the current, but 20-30 meters away from it. How to determine the center? This will help you binoculars. It is worth watching from afar the current in advance. It is necessary to consider the direction of the world It is desirable that the hunter watched the current, looking to the east. Thus, at sunrise, you can better see the kosachs. The material from which the hut is constructed, must be from the vegetation that is present on the current. At first a pole is made of poles, which is then closed with branches. In the tent it is necessary to provide 2-3 loopholes through which the hunter will observe birds and shoot. A review should be sufficient. If there are bushes or trees nearby, it is better to arrange a hut near them. It must be well merged with the terrain , otherwise the hut will alert the scythe, and they can carry the current for several tens of meters. Then you can not dream of an aimed shot. If the place under the hut is dry, then you can dig a hole with a step on which the hunter will sit. In this case, the hut will turn out much lower and will stand out less. In advance, you should think about the amenities . To do this, you must put a warm litter or carimat in the hut. You should also focus on the back , because to sit in a hut to be a few hours. Any movements and noises are undesirable, they can alert the current roosters. Think over the question in advance what to wear . Many do not have to go, but to sit – yes. Therefore, clothes and shoes should be warm. Rustling and other extraneous sounds from clothing are unacceptable. This method requires great care , there should be no noise, cracking dry branches and the like. Approach to the place of the current must also be still in the dark and on the edge of it. At the beginning of the toking, you can choose the rooster that is furthest from the center of the current and carefully approach it while muttering. The hunter in this case should be ready to shoot all the time . Kosach during the current runs a lot, so at any moment can jump in front of the hunter. It is necessary to shoot only when the rooster itself is clearly visible, and not just the white feathers of its tail. It is used when hunting from the approach , on the ground, which does not allow to approach the scythe for a shot. Before using it, it is worth learning how to imitate thegrouse’s voice, which will take some time and patience. A fake sound may cause the rooster to respond, but he will not approach the hunter. You should not often beckon, after a few seconds you need to take a break for 10-15 minutes. 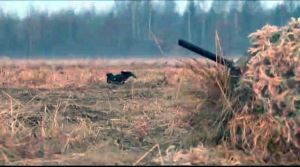 The spring black grouse is quite strong against the wound , so the gun should not be less than 16 caliber and have a sharp heap. 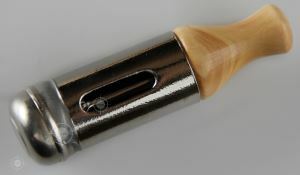 Cartridges use 3-4 numbers per container. When shooting from a hut , the trunk should not be far out of the loopholes; even this can alert the tokens. It is also not necessary to shoot, if the fraction can touch malyukh , it is better to wait for a more convenient moment. You should not take a dog for a spring hunt with a shovel , even if it is trained perfectly. Any movement of her in a hut or on the way can alert the birds, and they will fly away from the current. Leave her at home until autumn. The most active current occurs in warm clear weather. The kosachs also walk in cloudy weather, but a strong wind, rain, snow, frost adversely affect the activity of the current. Yes, and not very comfortable to sit for several hours in a hut in this weather.